Dr. Cassandra Gandia and Dr. Drew Lombardi are dedicated to caring for you and your entire family's orthodontic care and well-being. They take the time to create a personalized treatment for each patient and offer a wide range of services. It is their goal to make your visit at Hudson River Braces an extremely pleasant one and to send you home with a beautiful and healthy smile. 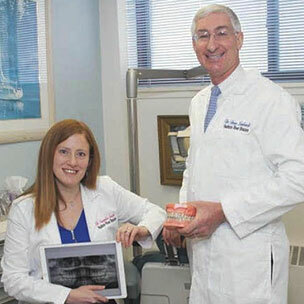 At our Ridgefield Park orthodontic practice, Dr. Cassandra Gandia, Dr. Drew Lombardi, and our team are dedicated to providing children, adolescents, and adults with comfortable, quality, state-of-the-art orthodontic care in a friendly environment. Your smile is our top priority, compassion is our trademark, and a perfect smile is our ultimate goal. We strive to not only create beautiful, straight teeth, but also a well-balanced face and a pleasing profile that will enhance the patient's function, appearance, and self-esteem for the rest of their life. Paying attention to each patient's specific needs and preferences is just part of what distinguishes our practice. It is our goal to make your course of treatment an extremely pleasant one, and to give you a smile that is both beautiful and functional. At Hudson River Braces, we will create an individualized plan of treatment. We feel that one of our most important functions is to listen to our patients concerns and educate them as to their best options in creating a beautiful smile. We offer various treatments, including regular braces, lingual braces, Damon™ Smile braces, and Invisalign®. After your treatment, our team will coach you on healthy habits of maintaining a perfect smile for the rest of your life. If you would like more information about any of the procedures that we offer or want to request an appointment, please contact our Ridgefield Park orthodontic office.